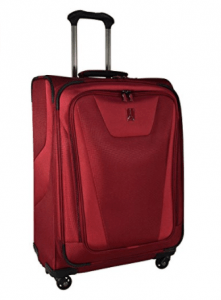 Travelpro Maxlite 4 Series 25-inch is an imported soft shell spinner suitcase made of 100% polyester fabric with a water-resistant coating. Thanks to its 360-degree spinner wheels you can move it very easily without much effort in all directions. You can adjust the telescoping handle that locks at 38 and 42.5 inches, so it gets pretty tall. The 25” Maxlite weighs 7.7 pounds and measures 25 x 18 x 11 inches (24.5 x 17.5 x 10.5 interior space) and needs to be checked in at the airport. It is not a very big luggage but not small enough to be used as a cabin bag, except for certain special circumstances with certain airlines. Thanks to the Honeycomb frame it is lightweight but rather solid and robust. The special counter grip makes your hands feel better. It includes very good quality, durable and ergonomic zippers that will last. This is a fairly spacious piece of luggage and you can expand it by up to two inches to gain a bit more storage space by pulling the zipper in the middle. By expanding it you will get more flexibility and have a low center of gravity, improving the stability. The contour grip is patented for its unique ergonomic design as it is comfy with the rubber touch points. And you also have better control when you’re pushing it through the parking or airport terminals. You have the hold down straps that can be adjusted and give you a bit more flexibility with your packing options. There is a large lid compartment where you can put things like your pressed shirts and a mesh pocket on the side for a variety of accessories. There is a full-bottom tray that is special to TravelPro to stabilize the rolling wheels so the durability is improved. And you can maneuver the bag very easily, smoothly and effortlessly. They perform a variety of quality and functionality tests on the bags in their In-House Product Test Facility before promoting it in the market. These include the fabric abrasion, carry handle jerk, fabric tensile strength, water repellency, cold crack drop, wheel system roll, temperature, zipper open and close wear, product stability and fabric color stability. The Maxlite 4 series bags are reported to have a better and bigger handle and zippers than the Maxlite 3 Series. There is no hook or strap for adding a bag on this model, but you’ll find it on some of the TravelPro cabin bags like the Platinum Magna 2. You can strap your smaller bag to the collapsible handle and it should ride just fine. This is not a cheap bag but it is well worth it for the sturdy build, functionality, and user-friendliness. Suitcases go through a lot of abuse by airline staff and users too, so if you pay a little more you will have much less headache later on. 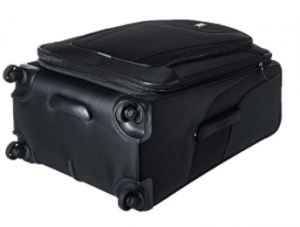 TravelPro is one of the best brands on the market and this bag comes with a limited lifetime warranty.